We will stay in a 4 starts hotel in Ried im Oberinntal, a nice town less than 10km away from the ski resorts. The club bus will drive us to the ski resort, but there is also a free public bus, which stops 2 minutes walking from the hotel. The hotel offers a sauna, where you can relax after a tiring day. Dinner in the hotel is included and the hotel has very nice common areas, so sharing your stories at night, is part of the fun! Have you ever wonder how many kilometres can you ski in one day? Would you like to know the whole resort without repeating any slope? Can you even make it to 100km in one day? Can you get the new SCR (Serfaus Challenge Record)? - Challenge SVT: 58,3 km - all missions need simulation! No black pistes, ideal for beginners willing to challenge themselves. - Challenge Mission: 68,1 km, intermediate level. 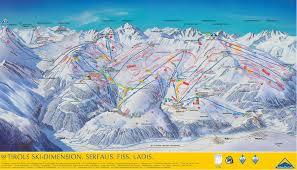 Right amount of black, red and blue pistes... enjoy the fun! 18 brave skiers (and even snowboaders!) already achieved it last year.